Colonel-in-Chief on her inspection of the Depot. During the late thirties a new wooden hutted complex was built to provide extra accommodation in anticipation of the outbreak of the Second World War. 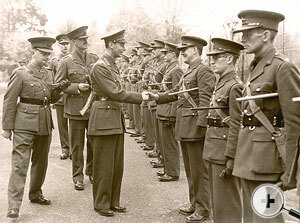 King George VI meeting officers at the Depot. | The King watches training at the Depot. His Majesty King George VI visited the Regimental Depot in September to inspect its Infantry Training Centre, this was followed by a further visit in November. 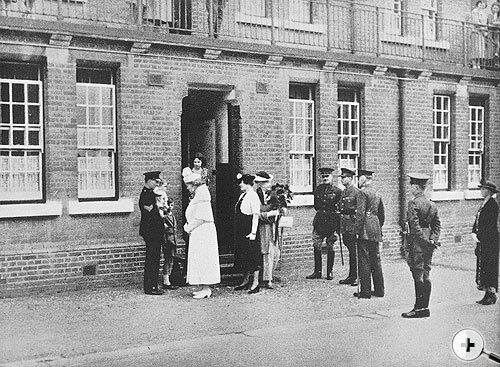 During the Second World War the barracks was used as a training and reception centre for Infantry recruits. During this period the ATS were in the then wooden hutted camp in Grange Road, Stoughton. 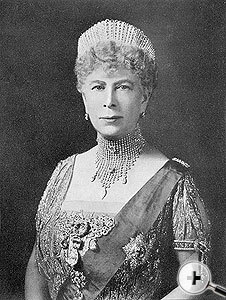 It was in this camp that HM The Queen, then HRH Princess Elizabeth, trained as a driver. to The Queen's Royal Surrey Regiment. 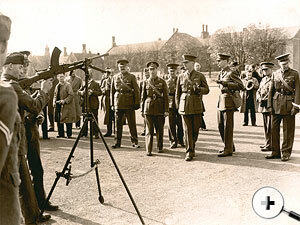 Field Marshal Sir Bernard Montgomery visited the Depot and was photographed addressing children from the local schools at the Barrack Gates. 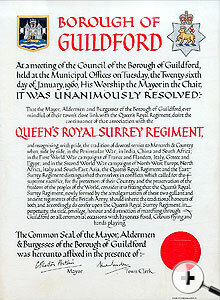 On the 29th September 1945 The Borough of Guildford conferred its highest honour on The Queen's Royal Regiment by granting a 'Scroll of Rights' or Freedom of Guildford. This granted the Regiment permission to march through the town with 'bayonets fixed, Colours flying and bands playing'. This honour was transferred to The Queen's Royal Surrey Regiment and then to The Queen's Regiment and finally in 1992 to the present successors The Princess of Wales's Royal Regiment. The Freedom was last exercised in September 1994.